Well, it is the last day of 2016, so what do I do? Well, I go out for some pictures. 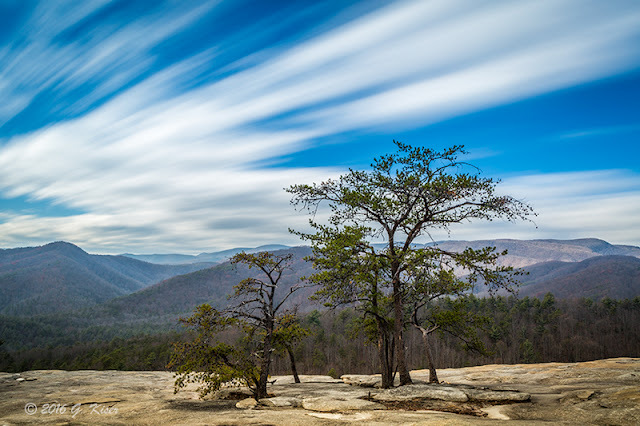 My original plan based on the weather was to go to Pilot Mountain and do some long exposure stuff with the knob as the focal point. The clouds were looking decent for that to take place, but the light was so diffused that it also made for really good "Old Iron" photography as well. 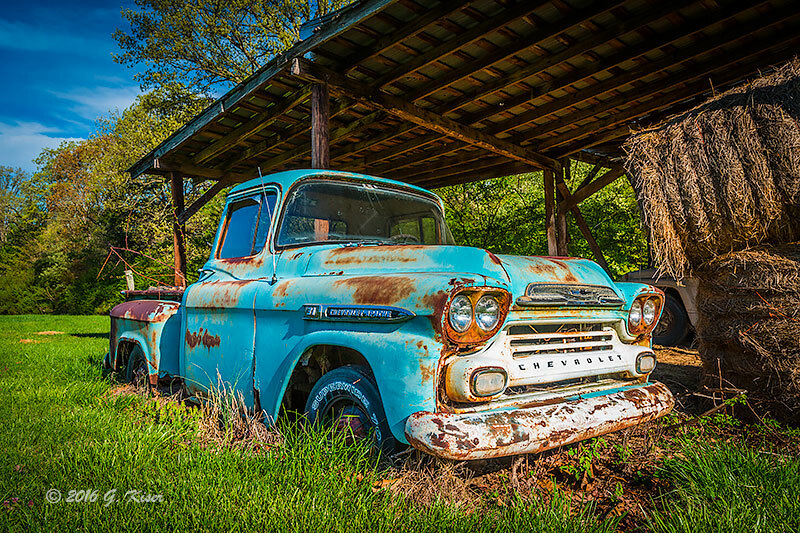 Working off of a tip from a fellow photographer, Randy Rogers, I set out to Sparta to find an old GMC heavy truck which he had photographed some time ago. 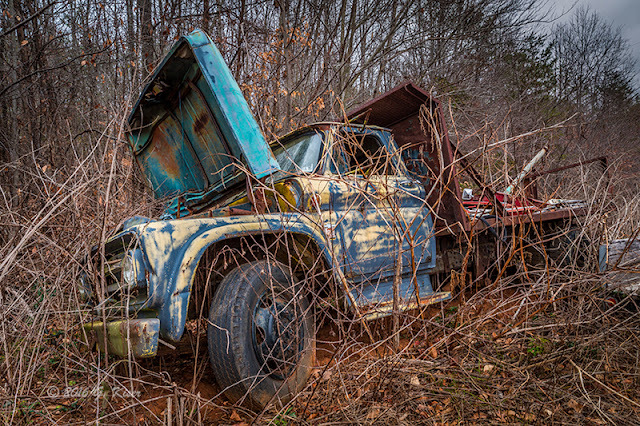 I had plenty of time to get to this truck and back to Pilot Mountain in time to get the end of the day light. The trip went relatively quick, although it was about an hour and a half away. The clouds kept changing up on me the entire time. By the time I got into Sparta, things were a dismal overcast with very little contrast in the landscape. Despite that, I was still on the hunt for subjects to shoot. As I was traveling down Hwy 63, just North of Sparta, I happened to see an old truck by a barn sitting off to the side of the road. It caught my attention, and it was close enough to the road that I felt that I had a decent chance in getting a good shot or two without needing permission to get access the property. I had to use my 70-200mm lens to get the reach that I needed, but it turned out that it compressed the scene very well considering that the elements were rather spaced out from each other. The hill behind allowed me to exclude the sky which would have exposed as a solid sheet of white. Using my color combo polarizer, I fine tuned the composition, while shooting through really tall weeds. To add to the difficulties, the sun was starting to burn through the thin overcast and was back-lighting the scene. 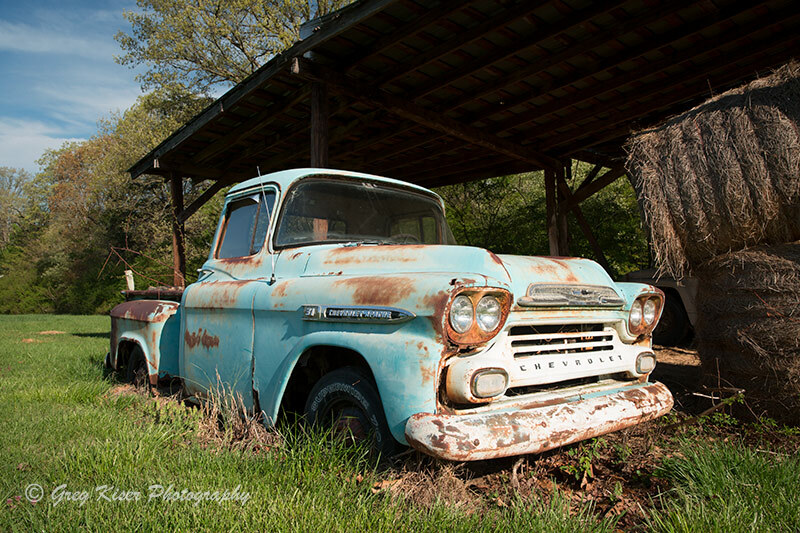 I had to time the shutter release to when the lighting was the most flattering to the old truck. I managed to get several different shots that were well exposed in between the blasts of sunlight. While I really like the feel of the first composition, I think that the second one works a little bit better, but in a different way. Simplification goes a long way with photography in most cases. 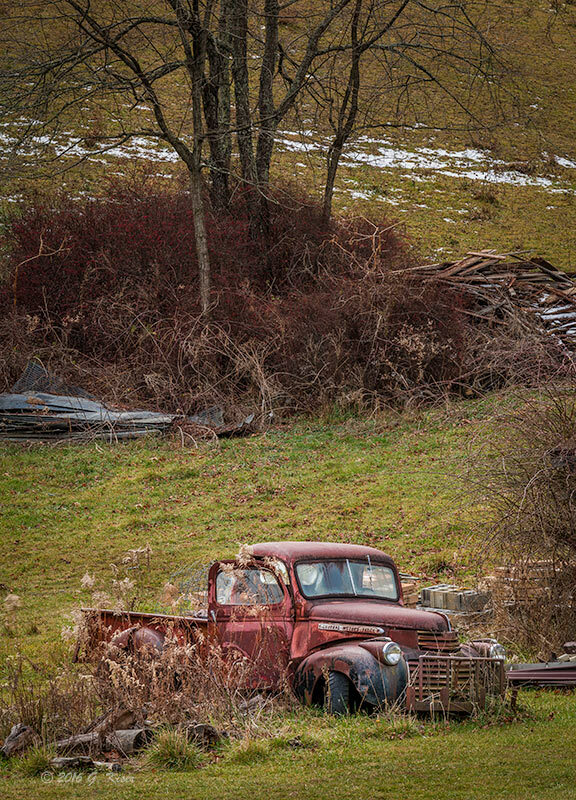 I would have liked to have had the barn in the shot, but eliminating it really focuses your attention on the truck, and the added openness to the top of the frame gives the tree a little room to breathe. For this particular moment, this one is my favorite from this location. Unfortunately, there was not much I could do with what was in front of me since it was looking like there was nobody to ask about entering the property, and I had a schedule to keep, hoping that the clouds would work out for Pilot Mountain. I decided to pack things up and continue on to my original destination a bit further North. I saw so many great subjects to photograph in this area, and want to come back again soon. For some reason though, I wasn't getting moved by what I was seeing which was why I wasn't stopping at each location. 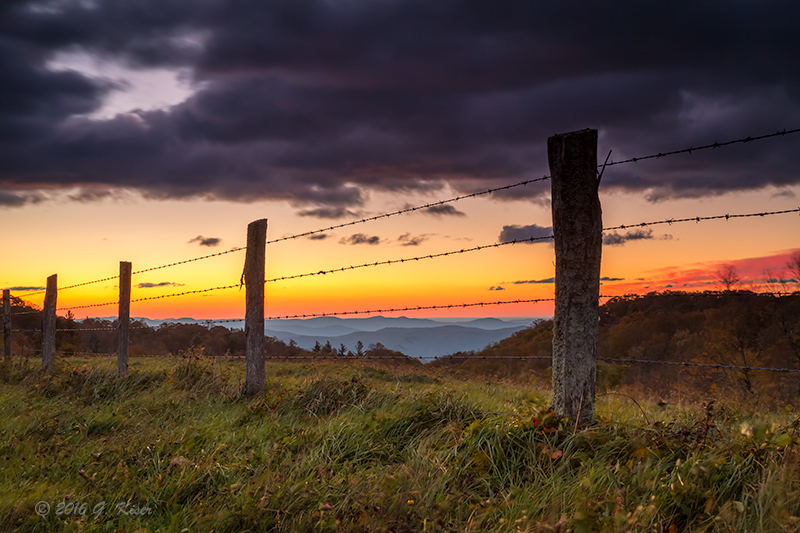 My mind was firmly planted on shooting landscapes, which I hadn't realized before coming out here. To make matters worse, the sky really wasn't looking like it was going to cooperate with me at all for my secondary shoot location. Well, at least I still had the old GMC that I was wanting to photograph. When I finally arrived at the destination (right where Randy had told me), I was slightly underwhelmed, but excited at the same time. There were a ton and a half of old tractors on both sides of the road. It was an odd sight, but one that wasn't really lending itself to photography all that much. The truck was a little on the blah side at first glance, and the rear wheels were off on the driver's side. I was here though, and I was going to work it for a little while. 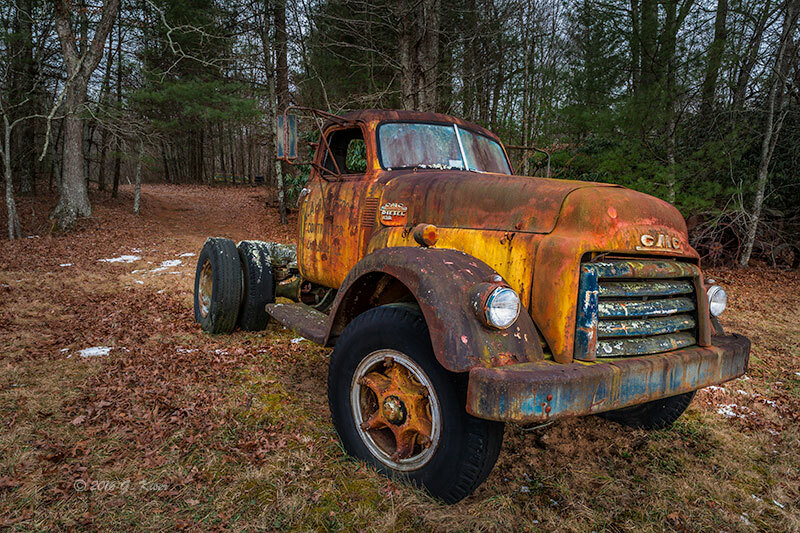 It took a few minutes of walking around this truck to really get the feel for what I wanted to do with it. The patina on the sides was wonderful, and it was starting to spark my creativity. I decided to shoot it from both sides and see how they turned out. I used my 24-70mm lens so I didn't go overboard with exaggerating the bulk of the front quarters. 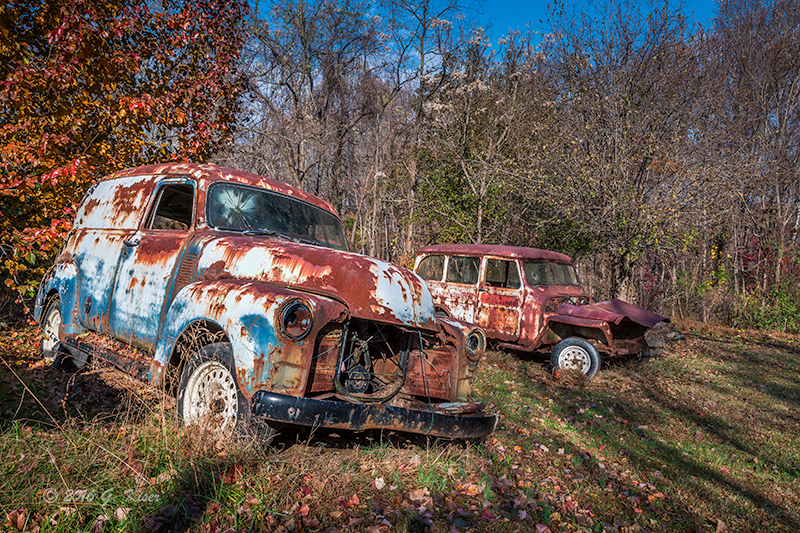 I added my intensifying polarizer to bring out the saturation in the rust, and reduce the glare. From that point, it was just a matter of hopping around different angles so I could get the best composition possible. I found that the driveway to the rear was a very nice element to add depth to the picture. Using the driveway, and the tree to the left, I had the needed balance to place the truck a little further to the right than I would normally. You see, one of the suggestions in photography is to give your subject a place to go. With the truck "driving" to the right of the frame, I really should be giving it more breathing room on that side of the frame. However, the driveway gives the truck context, and the tree gives a framing element to the composition. In my mind, the truck came out of the driveway and just conked out right there. Ending the frame close on the right, gives a visual element that indicates a sudden stop. This was a compositional choice I used to help tell the story. The visual tension that it adds also helps with the drama in the photograph. As I was shooting around the different angles, I found that I was really drawn to the side of the cab, and the company name on the door. I decided that I wanted to really capture that door the absolute best that I could. I tried quite a few different things, but nothing quite worked. I decided to break another one of my own rules and shoot the door from straight on without any angle. Normally this gives a flat image with no sense of depth, but I wanted to try it. I found that the sky was starting to get a little interest in it, and I was pretty sure that I could pull that detail out in post processing, at least enough to make the image work. I dialed in a fairly dark exposure, nearly a full stop beneath what I wanted to shoot for the cab. It was one of those shots that would either work extremely well, or one that I would look at and trash immediately. Well, when I got home and started to process the images, I really didn't like what I saw. Compositionally, I thought it had a great deal of merit, but the exposure problems were just too much for my liking. But...I have had several images that I've shot over the last few months that at first sight left me feeling very much uninterested, but with Lightroom, I was able to eek out details that the 5D Mk3 captured in RAW that were not showing up in the digital negative. I started to work the image, and found that not only did the camera capture every bit of detail in the highlights and the shadows, the colors were amazing! The more I worked the image, the more I liked what I saw. The depth came through with the trees to the right, leading off to the mountains, and the sky. The foreground is just POW, right there, with all the wonderful warm tones that balance out the greens and blues to the rear. This was, by far, my favorite image from the day, and the one that makes the trip very much worthwhile. That is a good thing because once I packed up from the GMC, I looked at the time that I had left, and there wasn't going to be enough time for Pilot Mountain after all. That wasn't the end of the world since the clouds were not what I had in mind for that location anyway. I set my direction towards home, and kept my eyes out for any other possibilities along the way. As it turned out, the sky started to do incredible things, and I found myself chasing the light (wishing I was at Pilot actually), but was never able to find the right setting for the sky. The closest I got was a cemetery with a very cool tree in the middle of it. I almost got out and shot that scene, but I still have some reservations about shooting cemeteries and there was not time to come to terms with that before the light was lost. Sadly, that was my last chance, as the light quickly fell, and the moment was lost. I'll get it next time. One of those things that I enjoy photographing in the Winter is rusty cars and barns. The lack of color in the landscape tends to suit these subjects well for the most part. It adds to the sense of age and decomposition in my opinion. Well, I have been out scouting for some locations to shoot these subjects for the past month or so now. I've lucked out finding a few here and there, but it is rare to find a lot of subjects in one place. A little over a year ago, I found a pretty cool salvage yard close by, but that turned into a one time visit unfortunately. However, I did find out that these yards do have a lot of potential for me photographically. 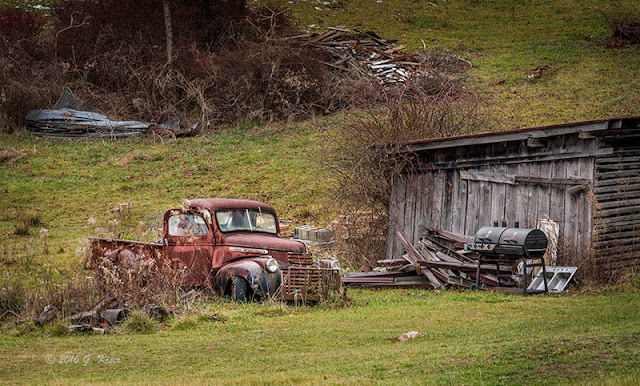 Does it provide that rusted out gem sitting beside of a barn? 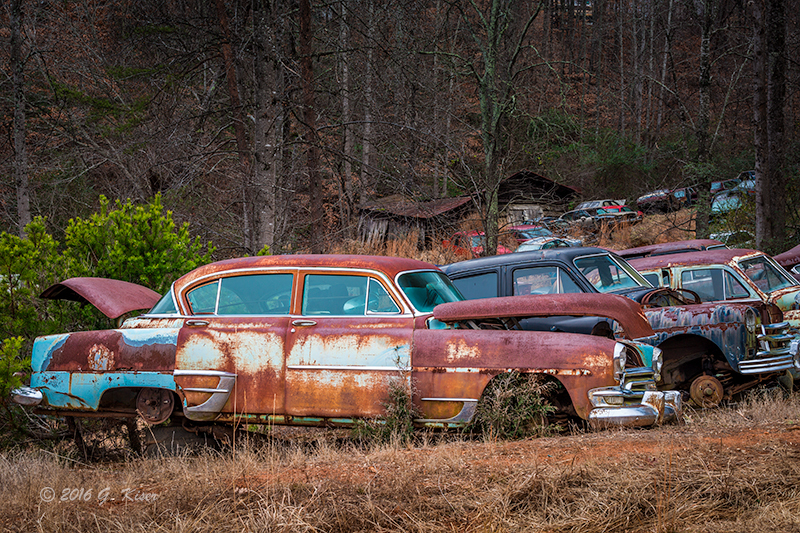 Not really, but when it comes to bank for the buck, you just can't argue with a yard that has a supply of cars from the 30's on up. I have passed by White's Salvage several times in my wanderings, and have been tempted to shoot there on occasion. The problem was, every time I was out that way, the shop was closed, and I was unable to talk to anyone. I could see some potential in the cars that were close to the road, but I disliked the fact that everything was so close together. I kind of let this location be a passing thought for some time. Last week, however, I decided to call and see what they thought about me doing some photography on the property. They were very nice, but informed me that I would need to come out during business hours. Well, that put a little kink in my plans since my work schedule now has me working during normal business hours, and their Saturday hours were reduced a good bit. Add in that I would need some overcast conditions to really make use of the scouting element since I was not familiar with the lay of the land. With the clouds, I would be able to shoot from any direction without having to worry about the direction of the light. I also, figured that if I was lucky, I could get a bit of drama in the sky as well. 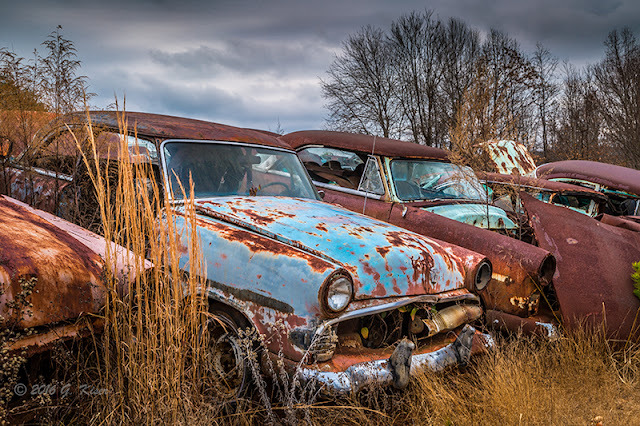 With having a few extra days off due to the holidays, and Toni being at work on Monday, I thought I might be able to go and check this junk yard out if the weather was conducive for it. Looking at the forecast, there was going to be nice, thick cloud cover throughout the day, and the clouds would be low which was an added bonus. That was a very good thing considering I was unable to get started until 9am when they opened. I would be missing the warm light of early morning, but having the clouds, that didn't matter to me. As promised, there was a nice cloud cover, and it didn't seem to be going anywhere. I set out, headed for Germanton, which wasn't that far away from home. When I arrived, I checked in with the folks in the office who let me know that I wasn't the only photographer who had come to visit. Well dang, that meant that I wasn't treading on new ground, so I would have to really be on my game to do something different here. Having not seen any of the other photographs done here, I wasn't sure what different would be, but I figured I would push myself and my camera to see what could be done. 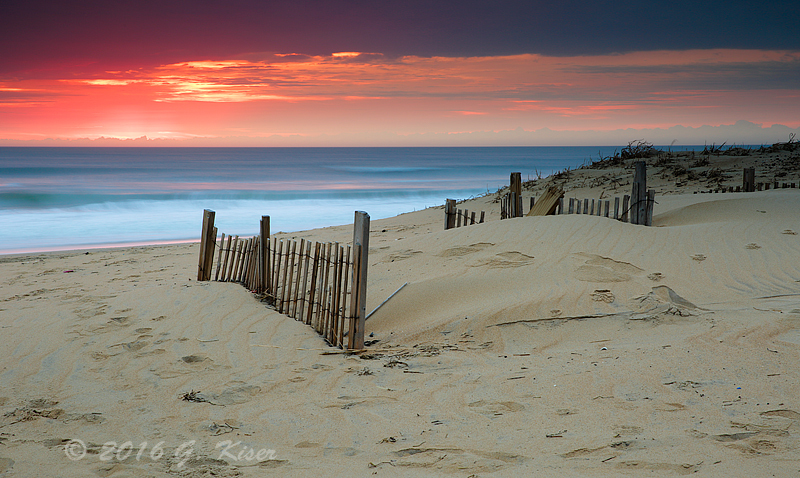 I started out with my long lens and a color combo polarizer to bring in a little extra color. I walked around a little bit trying to get in the right mood to capture these cars. There is a little more to it than going around and pressing the shutter button. I wanted to get a feel for what the cars were trying to communicate, and I was looking for a way to express some things that I was thinking. 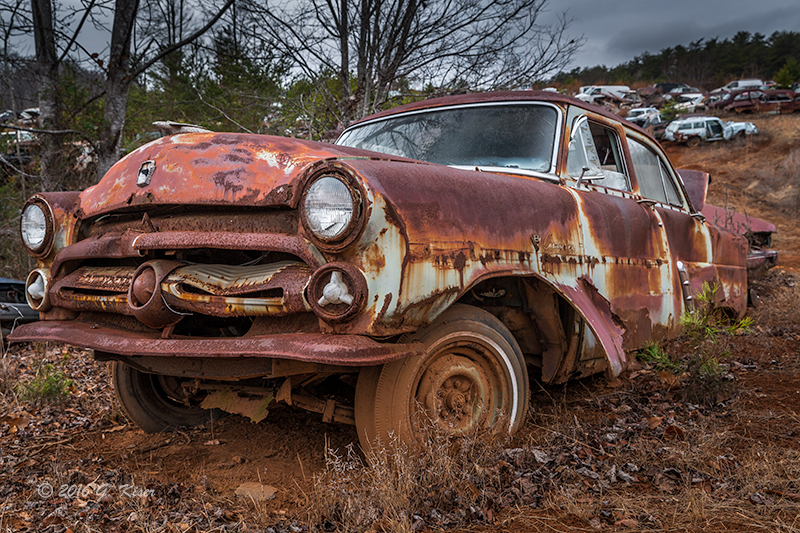 It didn't take long, before I found an old rusted sedan atop of a small ridge...wait a minute...nope....it was sitting on top of another car. 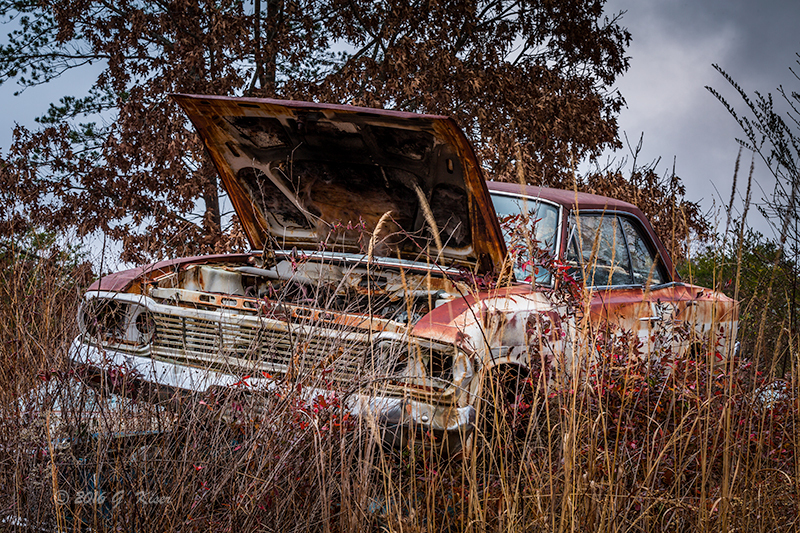 Well, the weeds were tall enough that the car below was successfully camouflaged, so I picked my location carefully, and framed the image with my 70-200mm lens. It took a little fine tuning to get the tree in the right place within the frame, but it eventually did work out. That was the first shot, and the most important one of the day. After that, the shots started coming a little easier, and I found my groove. Up next was a line of older cars which started with this sedan. I loved the blue tones in the fender, but was really unable to get that angle. However, there were enough textures and tones in the passenger side that it made for a great lead in to the overall landscape (opening picture). However, I found it very hard to get the right perspective up close with the long lens. It was time to swap glass to my favorite 24-70mm, which I love using for automotive photography. That was the trick, and with the same polarizer attached, I was able to get a slightly distorted view of the car, which is a look that I really like with this type of photography. By this point, I was getting very warmed up and was starting to move around more and more looking for the right views. I saw a bunch of cars that I really liked, and wanted to shoot, but invariably, they were packed in with Hyundais, or other newer cars. It was a treat to find a nice vintage (all steel, with rust) car surrounded by similar cars, or set out alone. When those opportunities came, I jumped on them! Remember when I said I wanted the clouds for some added drama? Well, the clouds were fair, but not all that great. However, with a bit of ND grad trickery, I was able to bring a little density to the sky and add that bit of drama that I was looking for. That technique allowed me to incorporate a lone tree right in the middle of some vintage iron. When I was setting this picture up, I found myself drawn to the car which was up on wheels. This slight attitude adjustment set this particular car apart from the rest, as did it's predominately light paint job. In a field of drab death, it was reaching up, and trying to be positive. It was looking toward the tree for direction. As many of you well know, Toni just loves trees. The stranger the better, but she has always enjoyed when I make trees my subjects. Conversely, she really doesn't care that much for my old rusty picture. However, as I was composing this shot, I couldn't help but think of her on so many levels. Without getting into all sorts of personal details, what I was seeing here represented a lot of what she is going through right now, and while I almost called this "The Tree of Life," I thought that "Hope" was more fitting to the current situation, and the image in front of me. Words can not express how happy I was when the developed image held true to my previsualization. Of course, the car continued to keep my attention and I saw the opportunity to capture the entire side by moving to the other side of it. 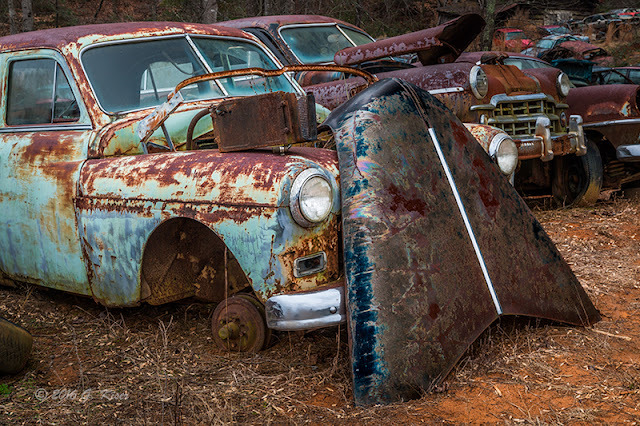 I find that I am always drawn to the blues and aquas in these old rides because it compliments the rusty tones that are so common on these 60 year old bodies. This particular station wagon had just that right mixture, and the fact that it was elevated on the front added to the story. It was just a cool sight, and too cool to pass up! Hey, like I said, I love the blues on these old vehicles when it plays against the rusty tones. I preferred to grab the shot when the car was set away from others, at least a little bit. However, there were times that I had to settle for a little clutter in the frame as in this case. Fortunately, I was able to deemphasize the neighboring vehicles in this frame through Lightroom. This allowed the Dodge to pop a little bit more, and keep the eyes where I wanted them in the frame. Of course I composed the shot with that purpose in mind as well. 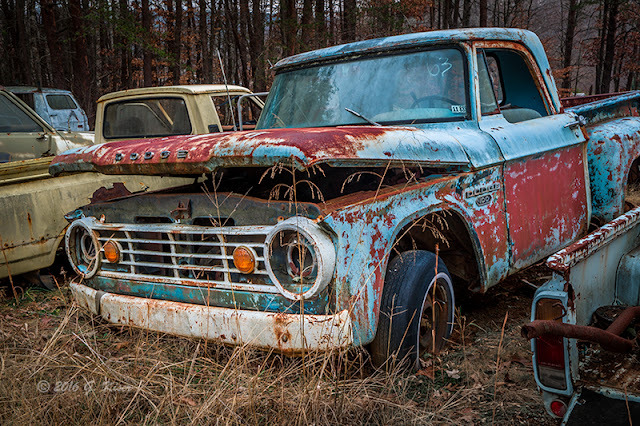 I would have liked to have done more with this old truck, but the vehicles were just too tightly packed to allow much else. For the most part, I like the grills of these old cars. That is where the soul of the vehicle is. Much like a face, the headlights and grill show the personality and character of these cars. However, there are times that I will still find some interest in a picture when the "face" is obscured. This is one of those times. The hood that is propped against the front of this blue sedan is in the shape of an "A" which provides a great compositional element with the strong diagonal lines. The fact that it is evenly placed between the headlights was a big plus! At first, I wasn't all that happy with the hood being the standard black, but as I really started looking at it though the polarizer, I could see a lot of character in that old hood. It had a lot of texture, and there was even a rainbow effect on the curve due to the light hitting it, and possibly oils on the surface. Either way, it was a nice touch, and I thought helped the picture quite a bit. I'm glad I stopped and gave this one a little attention, even though it looks like the car is hiding behind the hood. 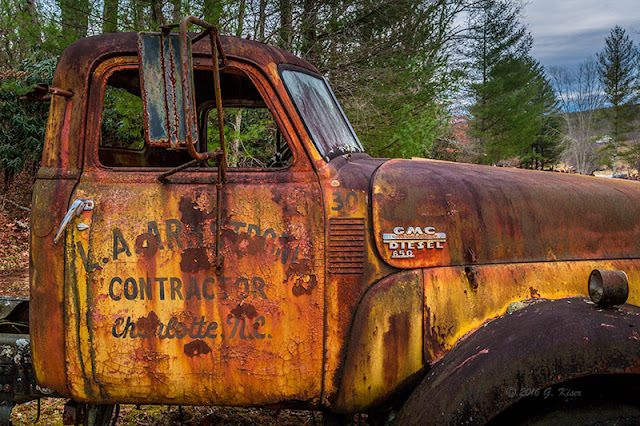 Next on my list of subjects was a heavy duty flatbed Chevrolet tucked into the wood line. It was a little hard to photograph due to the weeds that had enveloped the cab over time. There was also another truck parked right beside of it, which limited my compositional options. Despite that obstacle, I was able to get two different compositions that that showcased the wonderful patina on the cab. The first one is the standard 3/4 shot, but the one from the rear, I think I like even better. 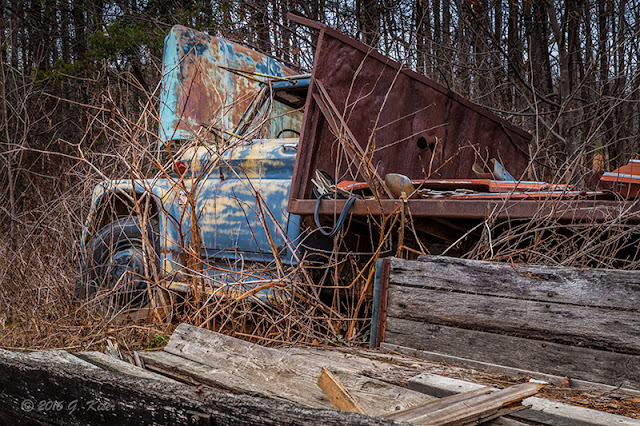 I used the wooden bed of the neighboring truck as the foreground, and had the bedside frame the cab of the truck in the mid ground. There was the added bonus of being able to get the patina on the hood as well. Of course, I could have just lowered the hood, but I prefer to shoot things as I find them. While over on the side of the back lot, I found this nifty old sedan which was underneath a blanket of long weeds. The colors were not all that exciting to me, but I just loved the flow of the weeds, and figured that I would make due with the lack of bright color in the frame. At least this car had a ton of character on the back panel, even with the trunk lid partially open. The other odd thing was that the missing hood on the front of the car was found right there on the trunk lid. Maybe somebody forgot their part? Well, it worked out for me, because when I finished this picture up in Lightroom, I found that I really liked it, and loved the visual tension that the weeds provided. Once I got away from the weeds, it was back to the open sky once again. I found a nice blue car situated underneath the clouds. There was actually a good bit of texture in the clouds, so I was kind of excited about this shot. My problem was the cars in very close proximity to the blue car I wanted. I decided to make use of the fact that the surrounding cars were primarily solid rust, so I could just use them as a basic contrast to the blue, and not worry about including them in their entirety. 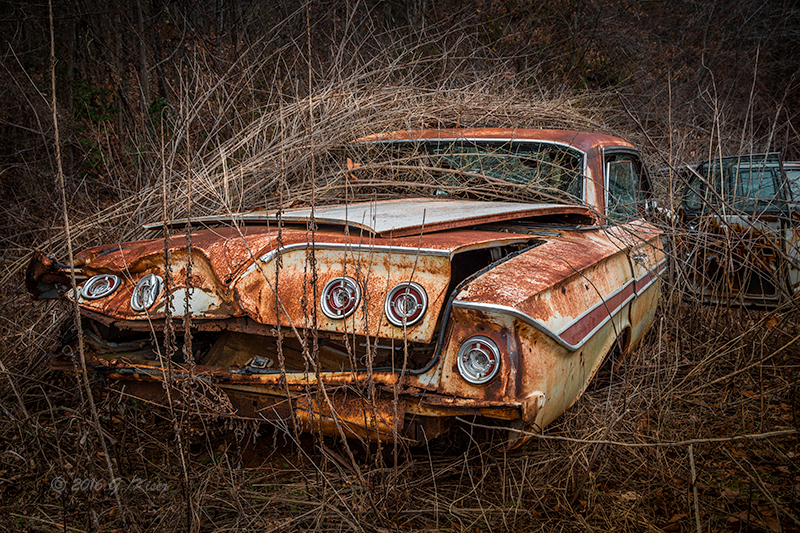 I was luck to have a tuft of weeds covering one of the cars, that actually acted as a visual framing element to the passenger side of the car.. The clouds added a nice moody feeling to the image, and the bunch of trees to the right gave a visual balance to the weeds, and completed the picture. The deeper I got into the property, the more little gems I seemed to find. 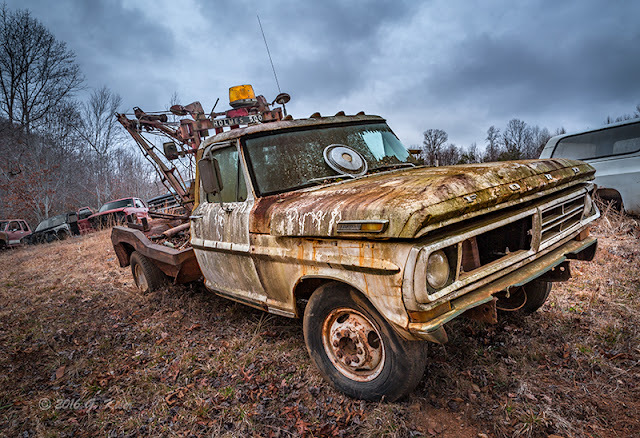 One of those, was an old tow truck that had actually been used by White's Auto Salvage before it was quite literally sent to pasture. Since Toni loves tow trucks, I really wanted to get a picture of this for her. However, I faced several different problems with this picture. The first problem was it was on a noticeable hill. Second, it was neighbored by a later model Mazda truck cab on one side, and a fairly good condition Blazer on the other side. The third problem was, in order to get the front of the truck (where the personality is), I was going to have a lot of sky in the shot. The clouds were still textured, but they were getting brighter and brighter with the mid-day sun above. This was an exposure nightmare for me, but I did come out here to push myself and my camera, so I decided not to shy away from the opportunity to learn. If the pictures didn't pan out, I wasn't out anything but time, and I was already invested in the time. I chose to go with a passenger side 3/4 shot which was shooting uphill, and included the light color Blazer. My hope was the Blazer would blend into the cloudy sky above. Knowing that if I used an ND grad filter for this shot, I would be cutting the exposure of the top of the cab and the towing rig on this truck. That was not something that I wanted to do. I decided instead to apply the ND grad in post processing so that I could still eek out the detail in the top of the truck, while bringing the exposure down in the clouds. Essentially, this meant that I was going to be exposing for the clouds and avoiding any clipping of highlight detail. I got in close, to exaggerate the lines of the truck using the wide end of my 24-70mm lens. I grabbed the shot, and looked at the LCD. I wasn't all that happy with how it looked, but I was relieved to see that I had plenty of information on the histogram with no clipping on either end of the graph. It wasn't until I got home and started to process it, that I found that I had actually captured something very close to what I had previsualized. It was good enough that I didn't even use the subsequent shots that were much easier to expose. One of the most iconic shapes in the automotive world is that of the Volkswagon Beetle. 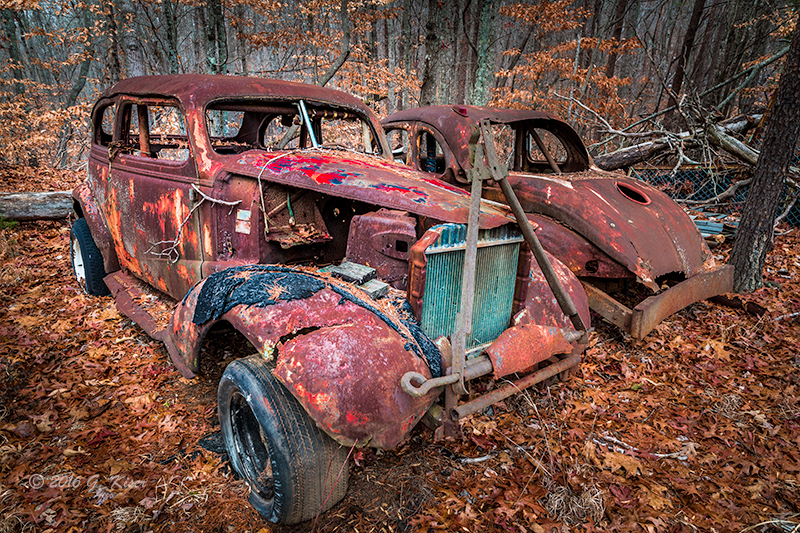 This car has been around in varying forms for nearly 80 years. It is one of those cars that I have wanted to photograph for some time now, but haven't quite found the right one. Well, today I found one that fit the bill close enough. 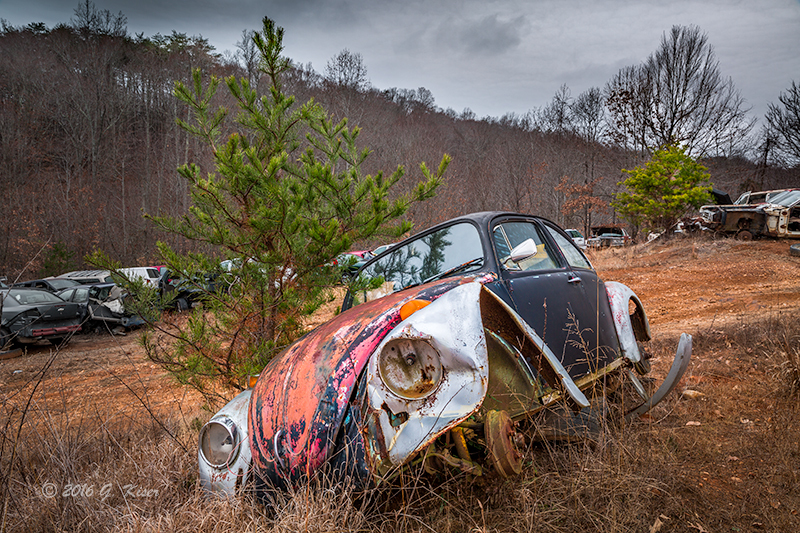 It was set apart from the rest of the cars, and it was sitting right by a small tree. The basic car was black which I wasn't all that wild about, but the silver fenders and the patina on the hood captured my attention. It was an ugly little thing, and one that would work well in a photograph. I set things up, and got things carefully positioned so that the cars in the background would not be as intrusive. I watched the depth of field, and covered the bright cars the best that I could. When it was all said and done, I had found a pleasing composition that used two green trees as counter points in the frame, and had the red hood prominently placed. It wasn't the best picture, but it was just quirky enough to work. By this time, I had been on the property for almost four hours. It was long past time to get back in the truck and head home. But I was destined to be that kid that was outside playing...just five more minutes. As I was walking back, there were cars that I had passed by without photographing, that I was now giving another look. It might be because I was not in tune with these cars and was listening to what they were telling me. It might also be because the light was shifting a little. But probably, it was me not wanting to quit just yet since I really wasn't sure if I had gotten "that" shot yet. Well, walking back, I happened upon a car that was about 90% rust covered, sitting atop a brown patch of ground. It was almost like it was blending into the ground to look at it. It just refused to stand out at all, but it was at a corner and was just too good to pass up. There were two modern cars that were very much in the frame that I had to deal with. When shooting a car like this, the last thing you want is for a Hyundai to show up to the party, but that was just what I had. I had to drop down low, an compromise to get just small portions of the Korean cars in the frame. I managed to all but make the one to the left disappear, and the one to the rear blended in due to similar color tones. That was the first hurdle of this shot. The second was making the drab car stand out. Well, I was fortunate that by shooting low, I had the sky in the frame. With the use of a ND grad, I was able to bring the sky into a nice dark gray appearance which helped draw the eye to the windshield. In post, I was able to add a little punch to the limited greenery in the frame, and to provide a little visual highlight to the car itself. This was a difficult shot, but one that I am pretty pleased with in its final form. With that, it was time to go back to the truck. I had spent long enough here, and didn't want to wear out my welcome with the folks at White's. However, the little boy came back out once I got to the truck. Across the road, there were several old cars sitting that begged to be looked at. I hadn't given them much thought earlier, because I was not in the right frame of mind when I first got here. However, now that I was "hearing" the cars, there was one that was calling to me. It appeared to be an old 30's model race car, which was pretty cool. I'm sure it had all kinds of stories to tell. I tried to hear them, but there were not quite enough clues other than the roll bars, racing tires, and windshield reinforcements. As with the previous image, I was facing the difficult task of making this car stand out against the similarly colored leaves. The colors that I had to work with were the patches of bright red, with a little bit of blue in the hood, and a slightly tarnished radiator. I set up the composition that I wanted, and dialed in a basic exposure. The lighting was so even that the exposure was simple...maybe the easiest of the day. However, there wasn't much visual pop in the image. That would be taken care of through Lightroom with the addition of some contrast, and some dodging and burning. I'm sure that the image would have more pop in the summer with more green around the car, but I think that in this case, the uniform color tones actually work well for the picture as a whole. It adds more visual interest since it forces the viewer to really look into the frame to seek the clues about what is being seen. My truck was only about 30 feet from this particular car, so I no longer had any excuses to stay out. I went ahead and packed the camera up, and dropped by the office once last time to let them know that I was leaving. It had been a really good day, but I wasn't really sure how good of a day until I got home and started to process the images. I knew that I had captured 88 frames worth of pictures. I figured that if I was really lucky, I would have between eight and nine new images that I would be keeping. Well, after it was all done, I had a total of FIFTEEN images that I considered were good enough to keep. That was pretty incredible, and put me at nearly a 20% hit rate which was outstanding! 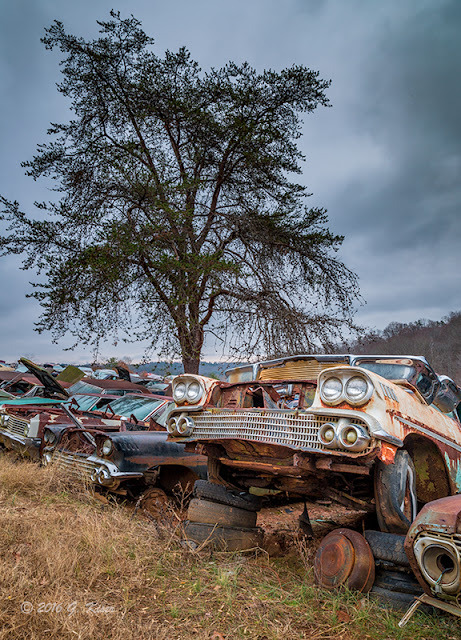 Junk yards might be a mixed blessing since they are so packed, but it is hard to deny that the number of potential subjects is very high. Today proved that if you open your mind, and listen to the cars, you will find a lot of great eye candy among the derelict automobiles. 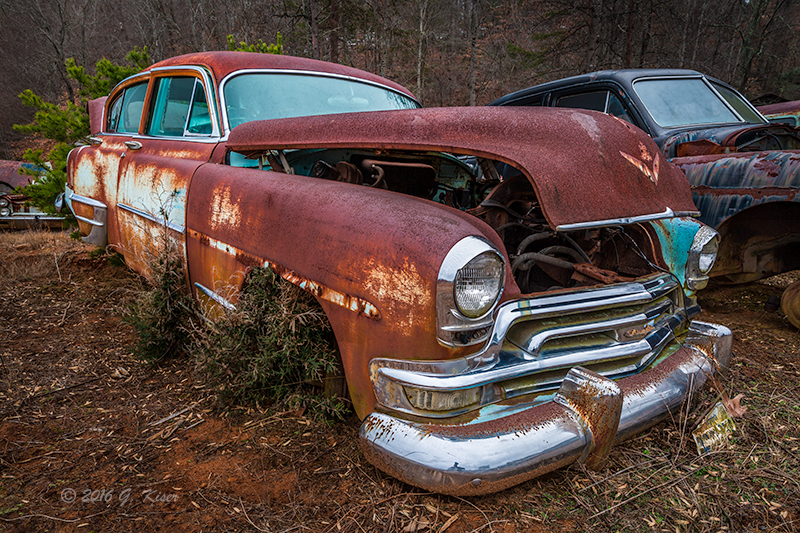 I am very appreciative to White's Automotive for allowing me the privilege of walking around with my camera. I'm sure I will be back in the future since there is still another third of the property I haven't even stepped foot on yet. Holiday weekend, cloudy skies, light rain, free time...yep, that means getting the camera out for a day of photography. 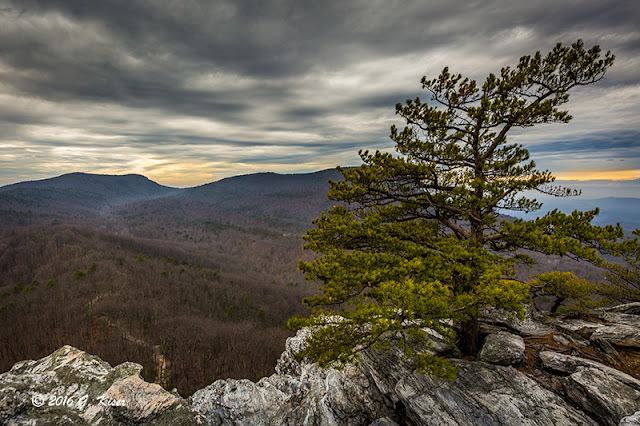 My intention was to do some more long exposure shots of the clouds, and I decided that I wanted to hike up to the summit of Hanging Rock to get those shots. The weather was a crap shoot for that, since there was probably going to be too much in the way of clouds and overcast conditions, but I wanted to give it a try. I also knew that with the rain, the Lower Cascades would probably be looking pretty good, so that was going to be my plan B.
I had a bit of a treat today as Sierra wanted to join me. 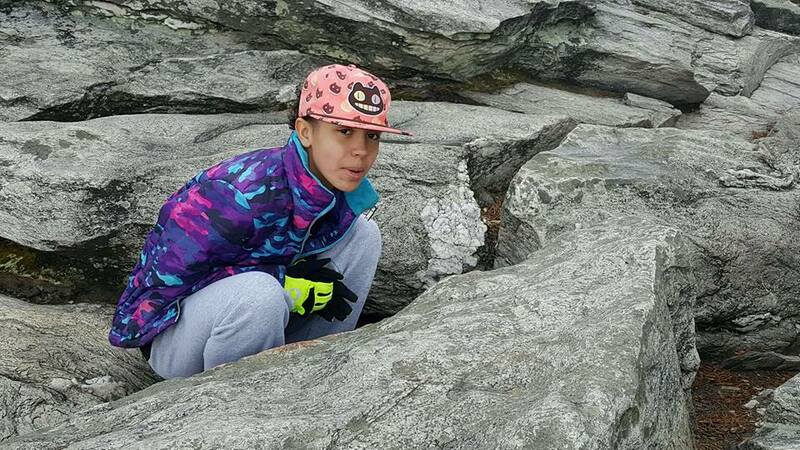 She enjoys Hanging Rock and she hasn't been in some time now. Well, we needed to correct that quickly. The only problem was, when I got up, there was a large cell of heavy rains moving across the mountains, reaching down to the house. This was not going to be a good situation for photography as I am not really equipped to shoot in the driving rain. I decided to wait the storms out, which actually didn't take too long. At about 9am or so, I woke Sierra up and had her get ready for the adventure. She was agreeable with doing the hike up to the summit, although, I probably didn't really explain it all that well to her. That was probably for the best as she might not have wanted to go with me had she known that the hike was fairly strenuous, and was about 1.3 miles in one direction. Whether she was ready or not, we were going to have a great time! 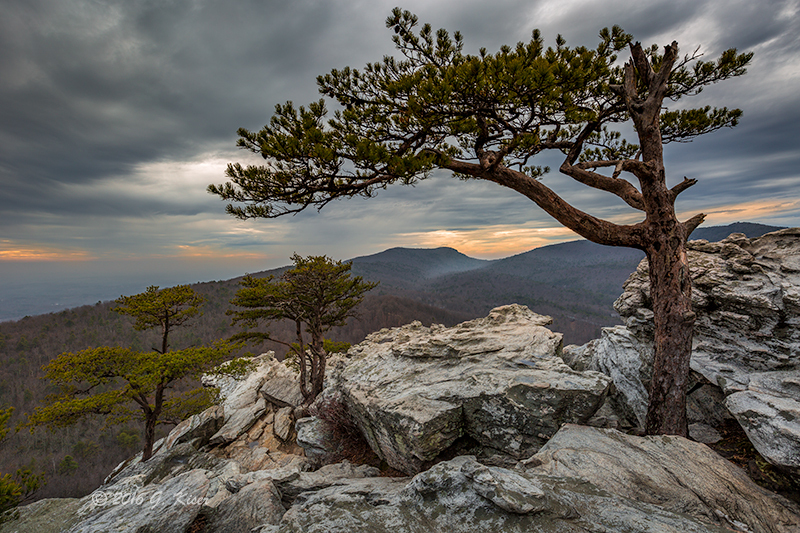 All the way out to Hanging Rock, the clouds would try to break up, and then they would go back to full overcast. There were little pockets of rain as well which dampened my spirits. I was really starting to think that we would be better off going with the waterfall over the summit hike. That would have been ok with me, but I was actually looking forward to photographing up high in this weather since I have only ever done it on sunny days, with none, to partial cloud cover. But I knew that full overcast wouldn't really do me any favors, and would really not be worth the hike. When we got to the entrance of the park, I looked up into the sky. I wasn't impressed, but I had seen a great deal of changes on the ride up there. I made the last minute decision that we would go ahead with the hike, and see what we could see. I was fully prepared to come away with nothing at all from the summit, and I was ok with that. Sierra reminded me that the hike was fun even without the pictures (although by the end of the hike, she recanted her statement). We set off from the parking lot, and made our way down the trail to the summit. The sky started to break up, and I could see lots of movement in the clouds. This was excellent, and I was so excited that there might be a good chance for some long exposures today. We stepped up the pace, and started making the slow climb to the base of the summit. We pretty much had the park to ourselves which was great. I guess the occasional sprinkles were keeping folks away...at least for now. We both huffed and puffed up the stairs leading to the top, and Sierra kept questioning why every time we climbed up, we came back down, before climbing again. I didn't have an answer except that the trail builders liked teasing us. Anyway, we finally made it to the top, and worked our way to the summit that is Hanging Rock. Almost immediately, we were hit with the wind that the trees had been protecting us from. It was cold and it was powerful. So much so that I didn't feel comfortable going out on the edge like I have done so many times in the past. It was no problem though, as the sky in that direction was not all that interesting. In fact, I was having a hard time finding some interesting areas in the sky to shoot. Because of that, I decided to work on compositions and find something interesting to shoot if the sky was going to cooperate. We had been up there for about 15 minutes and I had not found any interest in the sky, and hadn't found a composition that I liked either. Maybe this was all for nought. We still had plenty of time to hike back and head out to the waterfall at least. But I wanted something from summit DANGIT!!!! I can't explain it, I'm not sure I even want to try. But...despite the fact that it was around noon-thirty, there was some faint color in the clouds in the distance. How could this be? This was about the worst time to shoot normally because the sun was at its harshest. The heavy clouds above were blocking that for me, but the sun that was shining through really should not have been quite this warm. Well, who was I to question the sky. I had my shot lined up, I waited for as much lull in the wind as I could expect and fired off a shot. I recomposed slightly to take advantage of the sky and fired off another, and then another. The trick was getting the wind to calm just enough that the tree would not blur too bad. Because of this wind, I was unable to consider doing any long exposure work, even though the sky was perfect for it. Regardless, I was excited about what I was potentially going to get. It was either going to be amazing, or it was going to be garbage I thought. Since the sky seemed to be holding the light, I decided to move my camera around and try other compositions. There are no shortage of funky shaped trees on this patch of rock, from the high winds no doubt. I had several to choose from, but they required getting in close to isolate them. That meant that I had my 16-35mm lens fixed to the camera. Not only did it allow me to get up close to the trees, it allowed me to capture more of the sky than if I had used a long lens. There was no need in any filters because the lighting was very even, and I wanted as fast a shutter speed as I could manage. My next composition that I decided on used the same sky, but in addition to the odd shaped tree to the right, I included the trail that Sierra and I had used to get to the summit a while earlier. It lead to the saddle in the distant mountain range almost perfectly. This was a little more straightforward of a composition, but I liked it nearly as much as the first one. The sky was just awesome! The awesome sky lasted only a bit longer before it became drab again. With the relentless winds pounding us, Sierra and I decided that I had gotten enough from up here, and it was time to seek shelter in the trees below. Oddly enough, on our way off of the summit, we passed by a group that was going out where we had just been. One of the girls was wearing HEELS!! Wow, I would have never considered wearing heels to hike in. That just seemed dangerous. I asked them later on why she was in heels. Turns out one of the guys and her had just gotten engaged and they were doing their engagement photos on the summit. That was just too cool. I just hope that they had a little better luck with the wind than I had. Sierra and I worked our way back to the parking lot where she grabbed a quick snack. It was raining, and the clouds were very blah at this point. It was still early though, and we decided that we would head over to my alternate location...the Lower Cascades. With all the rain that had been falling recently, I was expecting it to be alive with water, and I was excited about the possibilities since for the most part I've been less than happy with my attempts at this waterfall in the past. When we arrived, I immediately saw a fallen tree in the pool below the waterfall. My instincts told me to react by saying "well crap, I don't think I can move that." However, as quickly as I though that, I saw possibilities. 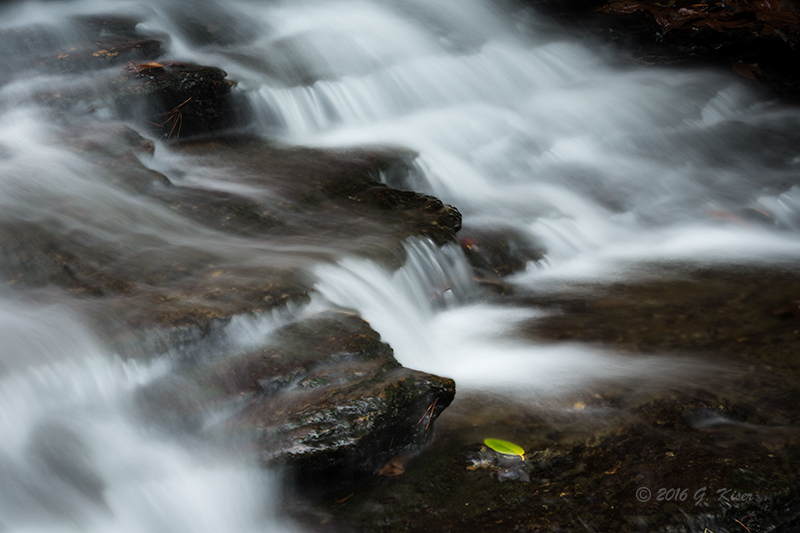 This was one of those moments where I could shoot this waterfall different than so many before me. I'm not sure how long this tree had been there, but I knew that things like this don't stay for a long time, and that meant that I had the opportunity to make some real one of a kind art from this waterfall today. My excitement level went through the roof...until I realized just how hard it was to incorporate into a composition in the position it was in. Sure enough, I was unable to move it at all, so I had to work with what was there. My favorite composition using the tree was to get right up on it, using my 16-35mm lens, and get in down low. I found that getting low did two things for this composition. First, it got a lot of the overhanging branches out of the way, and second, it allowed two of the branches to actually frame the waterfall. Yeah, this was going to be pretty cool! I was seeing all sorts of textures in this frame, and there was essentially a frame within a frame which make for very strong visual directing. Ironically, that was not my first attempt at incorporating the tree. 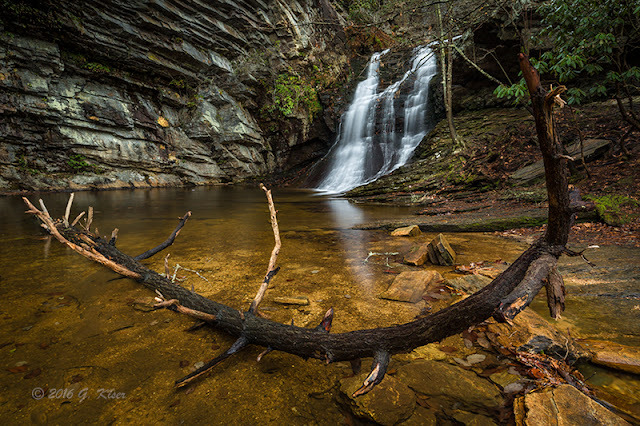 I started originally by going to this location where there was a slight bit of white water as it passed by the rocks. I used that bit of visual interest, the tree, and the waterfall to bring in the powerful grouping of three into the frame. 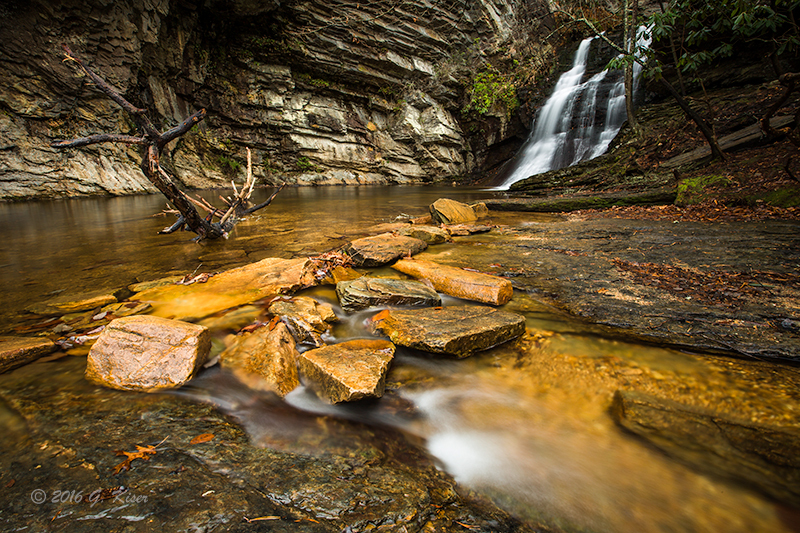 I also used the rocks as a leading line to get to the waterfall itself. The composition was just as I had envisioned it, but the tree wasn't as powerful as I had wanted due to the angle it was at. Still, this is a very strong image, and it turned out just as I had previsualized it. Looking at the previous composition, I decided that I might not need the tree in it after all. I flipped the camera over on its side, and recomposed without the tree. 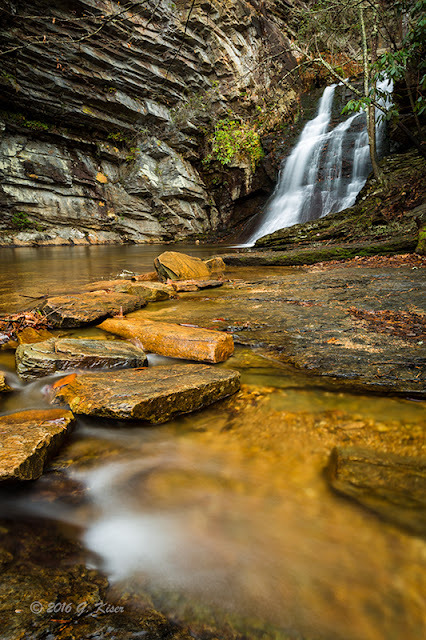 This was a much more direct composition that relied on the rocks purely as a leading line with the bit of white water as the visual foreground. Again, this was an effective composition and one that I was quite happy with. It was seeming that I was having a stroke of luck that I have rarely gotten with this waterfall before. I was loving it! 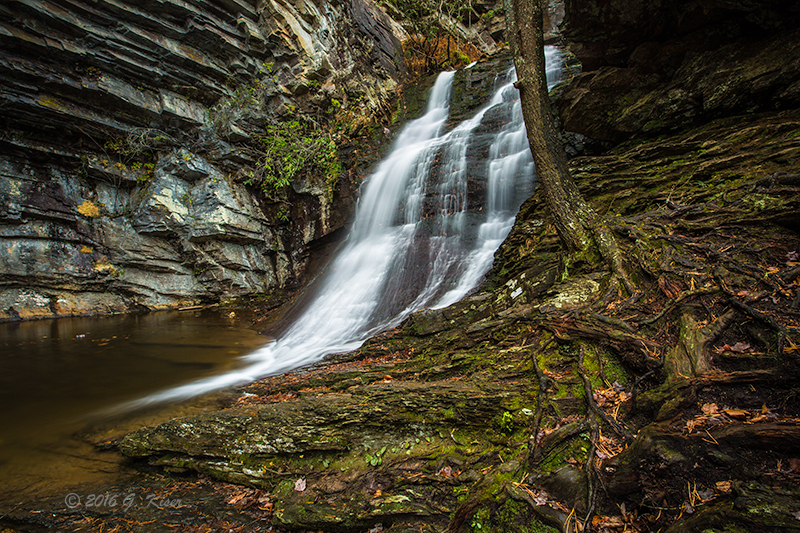 I decided that I wanted to move in closer to make the waterfall a bit more predominant in the frame. I also saw a tree with a root system that I'm sure Toni would have pointed out to me had she been with us today. I kept the superwide angle lens attached since I knew I wanted to exaggerate the roots as the foreground. To do this, I actually set up directly in the tangle of roots at the base of the tree you can see in the upper right of the previous image. What I love about this picture, besides the intricate root system is that there are three distinct layers of textures. In the foreground, we see the rocks and roots which are presented in such a way that you could reach out and touch them. In the midground, we see the silky waterfall which looks soft as cotton. The background is made up of the very hard edges of the rocky wall, which almost seems to encase the waterfall. There is a lot to look at in this picture, and those are the types that I really enjoy looking at, especially when they are printed out large. Only then can all the details be fully appreciated. When I had gotten all the goody out of the scene with my wide angle lens, I decided to swap in my 70-200mm for some intimate isolations. The only problem...the waterflow was too strong for me to get any really good isolations. The answer came from the secondary drops downstream. There was some really good waterflow there, and some visual interest that I could get up close and personal with. With the battery indicator flashing red, I was able to set this shot up and make the necessary long exposure to capture it. The composition was pretty strong to begin with, but the addition of the leaf at the bottom of the image actually makes it all work together. The embarrassing fact of this picture was, it was set up so quickly because the battery was about dead that I totally missed the leaf. It wasn't until I got home and looked at the digital negative that I actually saw the splash of color that the entire picture needed. It was a happy accident for sure, and partly pays me back for those times I missed elements in the frame that actually ruined the picture! With my battery dead, and it getting late, I decided to swap in a new battery, and put the camera away. I had nearly 80 frames to go through when I got home, and that was plenty for a couple hours work. Sierra and I were tired, and needed to get home for dinner, and to see Toni who had been working hard at home. This year started out rather confused when it came to my hobbies and things that I was wanting to do. On one hand, I was coming off of one of the most successful cycling years I had ever experienced, but was tired of the training that I had put myself through. 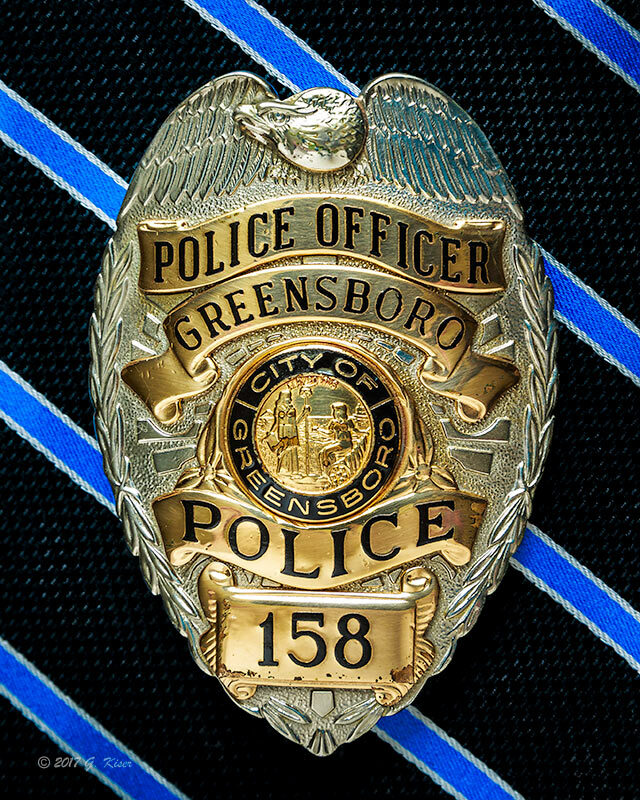 On the other, I was changing my job function at work which meant that I was trading in my patrol car office for an actual office inside of a building. Yep, I was going to be driving a desk after 16 years with the department. This was a very good thing for both me and my family. It also came with some bare walls that needed to be decorated. With the cold weather of winter, I had reduced my cycling to shorter rides, and only on days that I could manage the cold. On other days, I was starting to get back into my photography again with the hopes of getting some new pictures that I wanted on the walls of my office. Funny how things go full circle, since I originally got into photography to dress up the walls at home. Well, I was getting out occasionally, but found myself going to the same old places over and over that I have for years. I was actually taking many of the same pictures as I had done over and over. There was not much excitement for me, until I made a trip to Hanging Rock and shot something completely different. 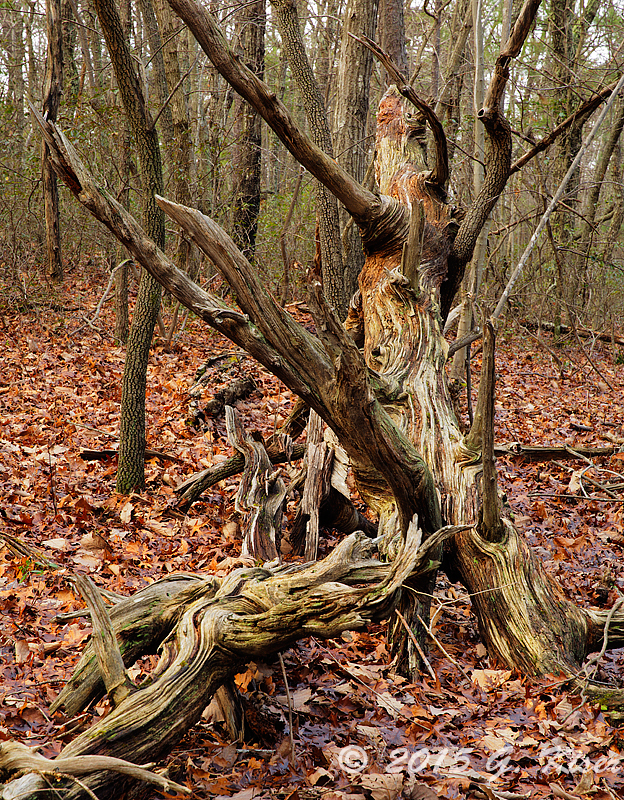 This simple old, fallen tree on the way to the Upper Cascades caught my eye. When I printed out the proof and showed Toni, she immediately fell in love with it. I liked it, but it wasn't all that great in my mind. She told me to get that printed out as a 13x19" and get it framed for the house. OK, why not. It wasn't what I would really want, but what the heck. When I printed it out, I was amazed at the detail and textures. I fell in love with it, and that love was even stronger once it got framed. I could then see what she saw in the picture, and I was impressed. It was this printing, and framing that really motivated me to do a bit more with my photography, and I had hopes of finding some really good pictures to put up in the office. Fast forward to January 1st, when I was out riding my bike once again, putting photography on hold. I didn't mind, the plan was to be a photographer when cycling wasn't possible (cold, wet, nasty days). I got my 62 miles in on New Year's Day like every cyclist was supposed to do. I felt great for having done the ride, but somehow I felt like I had pedaled the day away. When Toni and I went on our anniversary trip to West Jefferson, I took my camera as I usually do with the intention of getting out for some pictures in the mountains. We made several long trips around the area and I had fun with my camera, but I still didn't have that excitement that I was wanting to feel. My photographs felt forced for lack of a better word. My goal was still to find pictures for my walls in my office though. I didn't find that picture...Toni did. There I was driving around, minding my own business when Toni yells out something to the effect of "How about that barn?" It was too late, I had gone past it and missed it entirely. I asked if it was worth turning around for, and she said that she thought so. When I saw it, I was so happy that I had turned around. It was perfect! Set underneath an evergreen backdrop with a little bit of a snow flurry falling. There was a fence keeping me off of the actual property, and the road was under construction, so there were orange barrels all around, but that didn't keep me from grabbing several different views of this old barn. When I got home and processed the picture, I knew right then and there, I had one for the office. Now, I was experiencing the excitement that I love so much with photography. Unfortunately, the rest of January kind of piddled out photographically. I was getting out, but I wasn't seeing near the success I was wanting to see, and the excitement was dwindling once again. I was still doing a good deal of bike riding, but it was mainly on the trainer inside, since it was getting much too cold for me to ride outside. At this point though, I was more going through the motions on the bike, and my heart really wasn't in it any more. 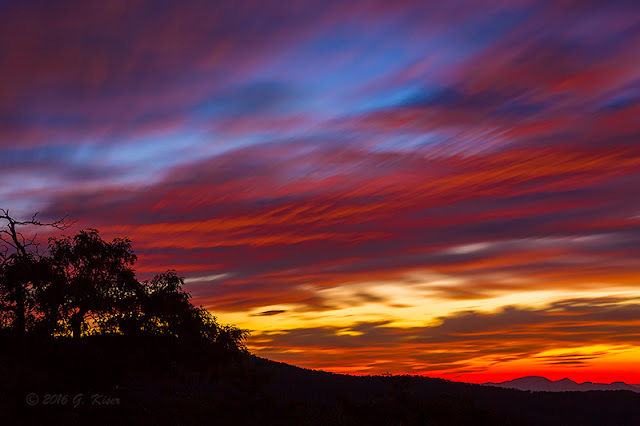 The sunrise wasn't all that great, but knowing what I could do with a camera made up for the shortfalls. I pulled out the long lens to compress the sky and take advantage of all the color that I could, and slowed the shutter down to smooth the ocean. This was more what I was looking for. I was still wishing I had brought my bike, but I was now happy I had brought the camera. Once I got home and started going through the pictures, I found a number of them that I really liked. I was happy now that I had brought the camera and not the bike. Yeah, I know, I'm not good at committing am I? It was nearly another month before I got out with the camera again. If memory serves, I was suffering some artist block, and was just unable to think of what I wanted to photograph. Of course, that pushed me back to the bike again, and with the temperatures getting warmer, I wasn't really complaining. 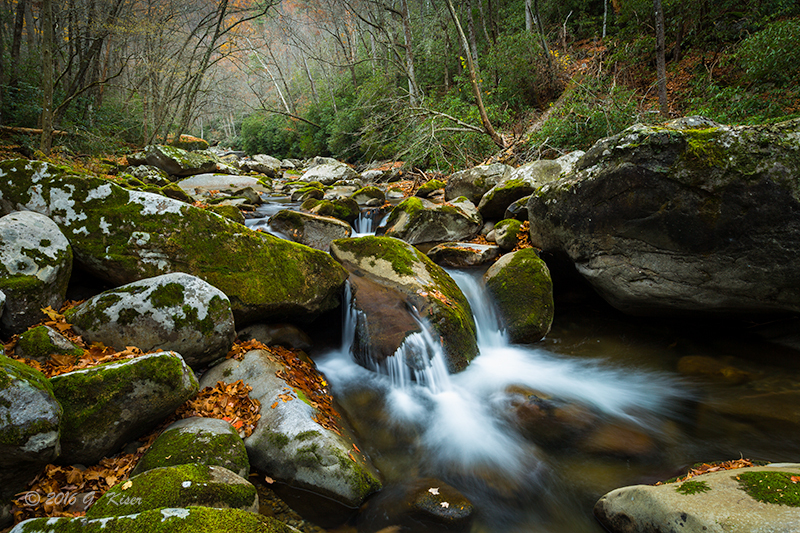 On the last weekend in March, it was raining and cold, and I was tired of being on the trainer, so I decided that I would take off and head to South Mountains to photograph the white water. It was largely a bust, and I didn't really get excited about the outcome. There were some decent pictures, but something just wasn't clicking between me and the camera. I found myself thinking less and less about photography, but I wasn't wanting to give it up. I just ended up spending more and more time on my bike. I traveled some 5,000 miles over the course of 2016, stopping occasionally to go out with the camera every other month or so. I just wasn't really happy with what I was bringing back from these trips. To make matters worse, I was having a very hard time with my prints having some very strange color casts on a good many of my proof prints. It was less of a problem when I printed through Photoshop, but it was still discouraging to have a nicely balanced image on the screen which printed through rose tinted glasses. Several things happened toward the end of summer which greatly changed my direction as a photographer. The first thing that happened was I decided that I would enter the Dixie Classic Fair as I had done in years past. I had no idea what I would enter, but for some reason, I really wanted to participate again. The second thing that happened was my computer crashed. Yeah, that sucked! Since the computer was nearly 10 years old, I really didn't want to upgrade the hard drive. My only option was to buy a new one. Since I was still dabbling with photography, I decided to find a computer that would be able to handle photo editing a little easier than my previous one. With Toni's blessing, I shelled out a nice chunk of change to get a new computer with all new software since all of mine was designed to run on Vista. My biggest challenge was whether or not to upgrade my Photoshop to the Creative Cloud. Ultimately, I did. I also got Lightroom which I had heard about but never used. I'll be honest, the Creative Cloud programs sat idle on the computer for a while before I went out and got some new pictures. 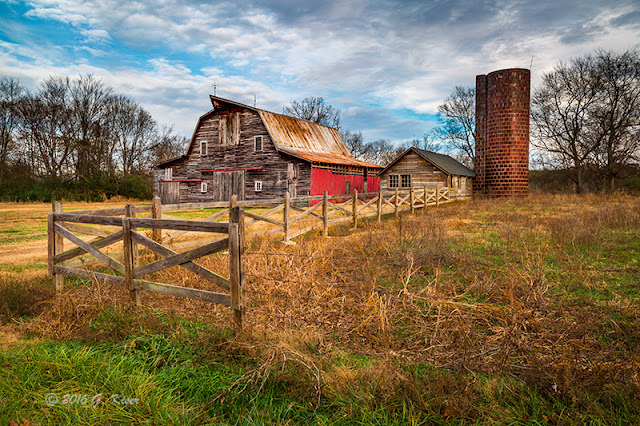 Wanting to get familiar with Lightroom, I set out one afternoon to shoot a barn which I had done several times before. This was not so much about getting a great picture as it was about really trying out the new software from a capture to print workflow. 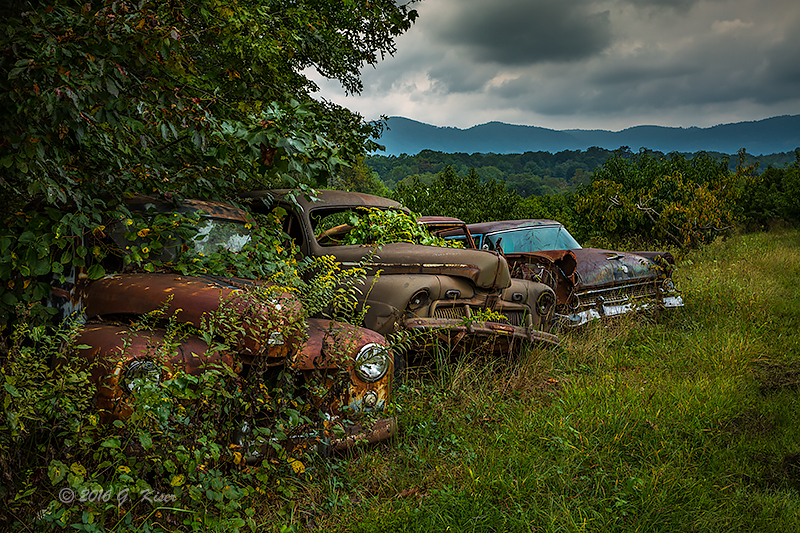 What I found while I was at the barn was, I just didn't want to shoot the same old compositions here. I was used to going with a wide angle lens and shooting it up close and personal. This time, I refused to do it, and I really don't know why. I fitted my long 70-200mm lens and stepped back. I had tried many times to include the white fence in this picture, but never really liked the outcome. The scale was always off. With the long lens, however, things came together perfectly. I had the picture I had always wanted. I was excited about it when I got home and tried to edit it in Lightroom. That was a mess! I had no real idea how the different sliders worked, but I fiddled with it for a while and then gave up. I brought the picture into Photoshop and started to work it there, but found that I was liking what I had in Lightroom better...so, I went back and started over in Lightroom. I ended up with a photograph that I really liked in color, until I printed it. Again with the odd color casts. I removed those, and printed it again, and it was tolerable, but not quite what I was looking at on the screen. To get around this, I did a B&W conversion which looked great and it printed out decent too. Overall, I was happy with the day, and had a couple of really good pictures which printed out marginally well. In fact, I was considering outsourcing the printing to see if maybe my color profiles were just jacked up. I wanted to see this print done as a large print, but wasn't really wanting to see it from my printer, LOL! I was feeling defeated in the middle of feeling happy. I spent the next few days looking at different YouTube tutorials on Lightroom, and reading all I could about it. I was finally able to make sense out of most of the controls in Lightroom, and knew what they could do, and the limits that they could be pushed. As a slight bonus, I was also searching out the issues that I was having with the printer. I found my answer, and it was one that I had known all along, but had thought I had already addressed it...disabling the automatic color management. Well, I now knew how to properly do it, and I was looking for a test subject. Since, I was mostly displeased with the print of the barn in color, I tried that with the new color management and found that it was spot on accurate with what I was seeing on the monitor. This was amazing...I had finally fixed a problem which had vexed me since getting into print making at home in 2008!!! I was on a roll, and now armed with a much higher quality of print. It was time to start deciding on what to enter for the Dixie Classic! 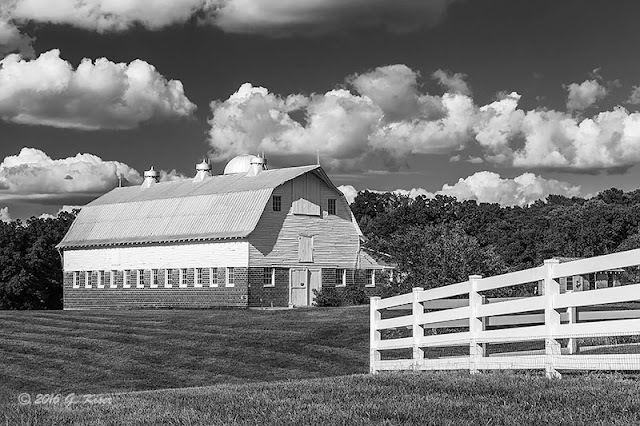 Well, I had my B&W entry already set with the picture of the barn. I just needed to find a color picture that I could enter. I was going through my recent catalog, but just couldn't find the right one I wanted to put in for a competition. I needed one that would appeal to a majority of viewers since I didn't really know who was going to be judging. I decided to try putting my new found understanding of Lightroom to the test and and go back for a rework of a previous image. I went through my old RAW negatives and found one that I really liked from a compositional standpoint, but had given me a terrible time with exposure latitude. I imported it, and started to do the edit. It looked awkward at first, but as I started to fine tune things, it all started to come together. I don't think that I have ever posted a RAW image before, but here is the original image shot in 2014. 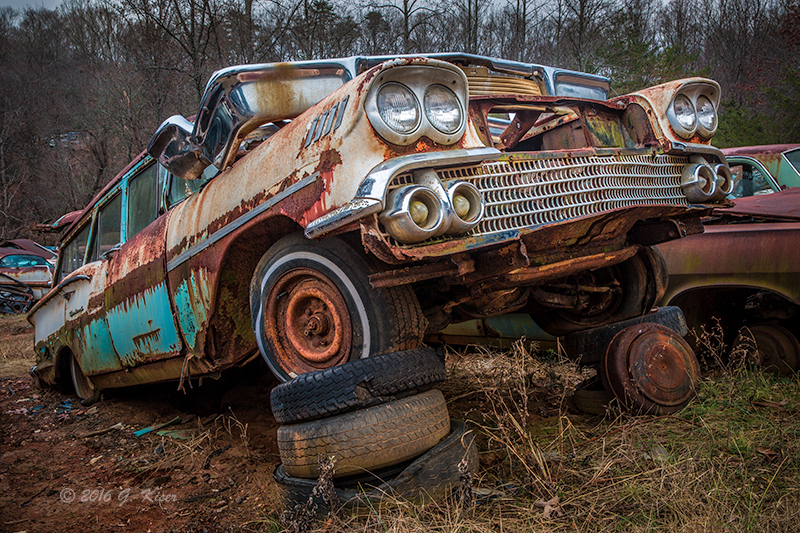 When I saw the difference that Lightroom had allowed to the details, my heart rate soared. This was going to be my entry for the Dixie Classic Fair. Knowing that my printer issues were more than likely fixed, I went ahead and threw caution to the wind and set it to print for the first time as a 13x19" print. This was a bold move since it costs a fair amount to print at this size, but I was feeling bold that night. When it rolled out of the printer, I was absolutely amazed at what I saw. It was excellent in every capacity, and I was beyond excited to get it framed. It was this photograph that really changed me as a photographer. While I still don't care for massive post processing, I have learned to embrace what the camera is actually capable of doing. The exposure latitude of my 5D Mk3 is much more than I had given it credit for in the past. I was now able to look at scenes differently, and had a much better chance of presenting what I had seen. Between the post processing abilities and the print making, I was now fully realizing the process that I had been striving for. I felt like a photographer! In October two things happened which went a long way in supporting my evolution as an artists. First off, my two entries in the Dixie Classic both won first place awards in their class. The second was after a trip to Virginia, I posted the new pictures online, and the very next day I went to work a dear friend of mine dropped by my office and made a surprising request that I wasn't expecting at all. After talking about some of my photographs, and discussing the handful that I had on my wall, she said that she wanted a print of the old cars lined up under the tree that I had just done. Wait...was she...did she just...YES, she was wanting to buy one of my pictures, and not a small one either. She was wanting a 13x19" print. Holy cow, things were starting to really come at me fast. I got it printed out, and delivered in about a week. I was so excited to see this one printed out big. Since it costs me to print like this, I don't do it often, so I love having the opportunity to see them, even if I don't get to keep them. While I hadn't been in the business of selling prints for several years now, this was a mixed blessing for me. On the one hand, it meant that my art was speaking to others once again, and that was great. On the other hand, it meant that people would be wanting my art to hang on their own walls. For an artist that is a scary proposition on many levels. I started to wrap my mind around that, and slowly started to gear photography back in the direction of sales without trying to be a salesman. With Fall upon us, I had to make a choice. I was either going to continue riding my bike and keeping up with my training, or I was going to focus on my photography. I was seeing that when I tried to do both, I ended up finding all the excuses in the world not to do either, or to only do one. It had been quite some time since I really hunted down Fall colors, so I decided that this year was going to be different. It started in late September when Toni and I went to Brevard in hopes of finding the early color at the higher elevations. That didn't really work out all that well, but I did manage to get out for a few sunrises that weekend which again showed me the power of Lightroom. I was all set for the month of October and had my plan on where to be and at what times with the hopes of finding the color as it peaked. The problem was, the drought that happened seemed to really mess up the timing of the season, and the colors didn't do quite what they were supposed to do...but that's nature for you. I went out every weekend in October regardless of weather. The most memorable trip happened on the weekend that Hurricane Matthew hit. It was windy as could be, but the sky was so full of awesomeness. 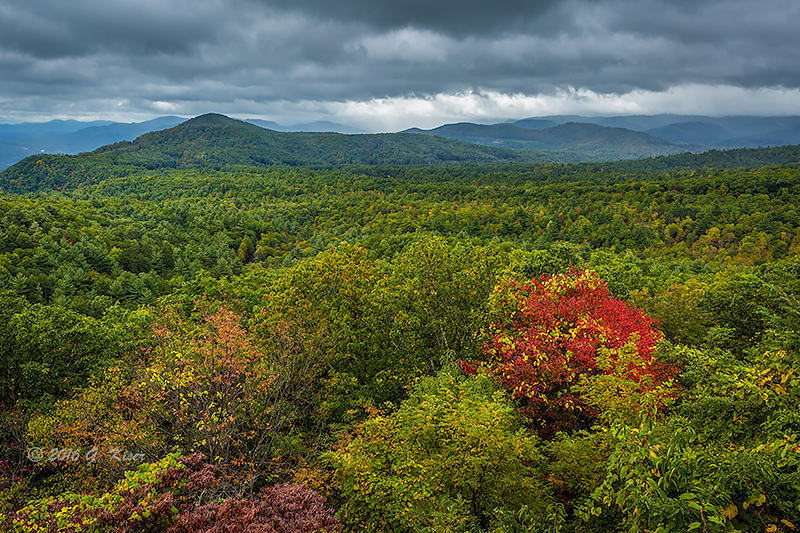 I spent the better part of the day on the Blue Ridge Parkway, but found very little in the way of Autumn color. The skies more than made up for it though. One of the hardest pictures to create came from Laurel Knob, and it was one that I really pushed the limits of the camera on, but found that the finished product looked very interesting, but I wasn't sure if I liked it or not. In a way, it was kind of like Braided Knot, pictured earlier in this article. I'll get into that a little more later on. Things were going so well, and I was really coming into my own as a nature photographer once again. I decided that I was going to need to learn as much as I could, and find new locations to shoot at if I was going to be successful as a photographer. After some searching, I found one of the largest regional photographer's clubs, the Carolinas' Nature Photographers Association. I went ahead and joined and started going to the meetings to learn as much as I could about photography in this area. One of the first things I learned was photographers in this area go far away to get their favorite images. Well dang, I can't afford to do that, so I tried to pay the most attention to things that were much closer to home. 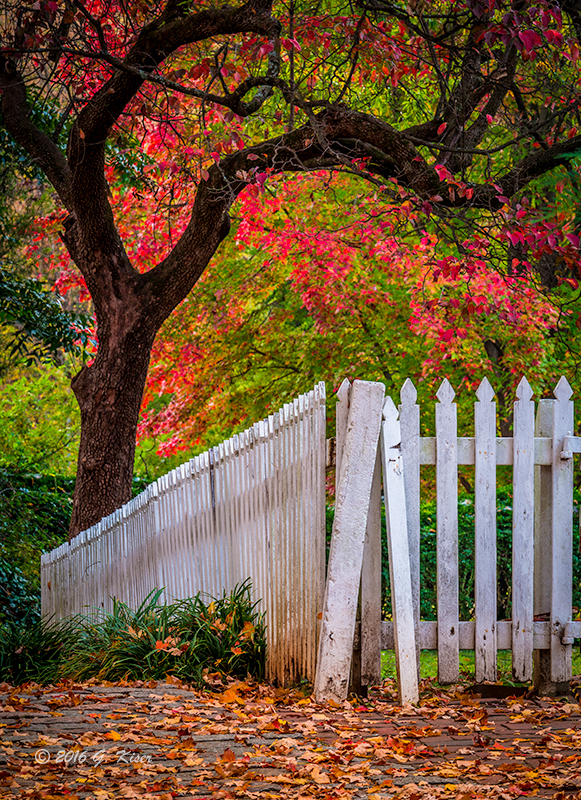 Still trying to chase the Fall color, I decided to stick close to home at the end of October and try Old Salem. I've been here many times in the past, and typically shoot the historic buildings, which are usually surrounded by modern cars, and signs that tell about the history. On this particular trip, I was more interested in shooting the leaves where I could find them. It was also one of those trips where I decided to break my normal patters by ditching the "normal" lens and using my 70-200mm primarily. This forced me to consider the compositions differently than before, and ultimately forced the creative process to step in. One of the resulting images from Old Salem was this one here which was another one of those that I just knew Toni would love. She enjoys pictures of trees that show their character, and this one did that with a blast of color from the setting sun behind. I was pretty sure that she would love this picture, and she did...but she surprised me with her request. Sitting in the living room, she told me that she wanted to change the pictures up and bring some new color into the living room. She detailed what she wanted to do, and told me that to balance out her beloved Braided Knot, she wanted a new tree picture. I was thinking that she was going to go for this one, since they were both shot in portrait orientation, but I was wrong. 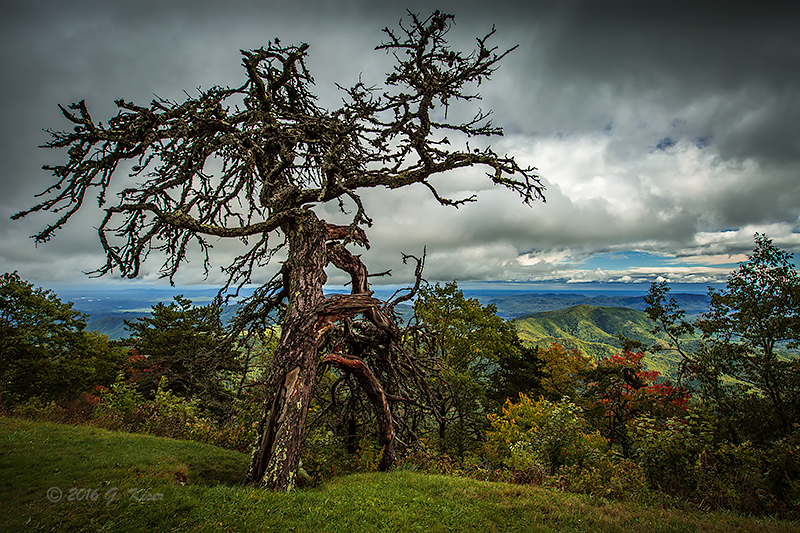 She wanted the creepy tree I had shot on the Parkway from Laurel Knob. Well, like I said, I liked it, but wasn't so sure I liked it like that. But what Toni wants, Toni gets. I have to be honest here. When I printed it out, I saw a lot to like about the picture, but I saw a bunch that I wished had been different. I was on the fence about it, and it took until the next morning for the inks to settle before I could really look at it. It was OK in my opinion, but Toni really loved it. I know that I am always harder on myself than I need to be, so I went with the flow and took it to the framer. 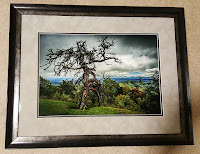 David Card who has been doing my framing for the past couple of years at After 5 Framing was impressed with the picture and worked with me in selecting the right combination of mats and frame to really make it pop. Since this was for Toni, I went wild with the options and tried not to cut any corners. I was feeling a bit of buyer's remorse after getting the bill, but I liked what was planned for it. After a couple of weeks it was ready and David called me and in a very creative way told me to prepare myself for the finished product. He said this was the best one to date. And, when I picked it up later that day, I have to say, I agreed with him. It finally made sense in the frame, and it all came together. Of course, Toni loved it and was happy to have it on the main wall in the living room. The story wasn't over with that though. David asked me if I would consider selling him a print of this old tree. Heck Yeah I would!!! He said that this was only the second time that he had wanted to buy a piece of art from one of his customers in all the years that he has been in business. Talk about humbling! Well, I went home and printed it out once again as a 13x19", which was signed on the front by request (little trivia for the collectors out there). I again had that mixed emotion on seeing the print. I kept picking out the things that I saw wrong with the picture, and that brought me down from the high that I should have been feeling, but David liked it, Toni liked it, and I was doing these prints for them. Well, I took it to work, and had it laying out getting ready to take to David, and I had several folks drop by and talk to me about it. One of which told me that he was planning on getting several of my prints for his home and office. 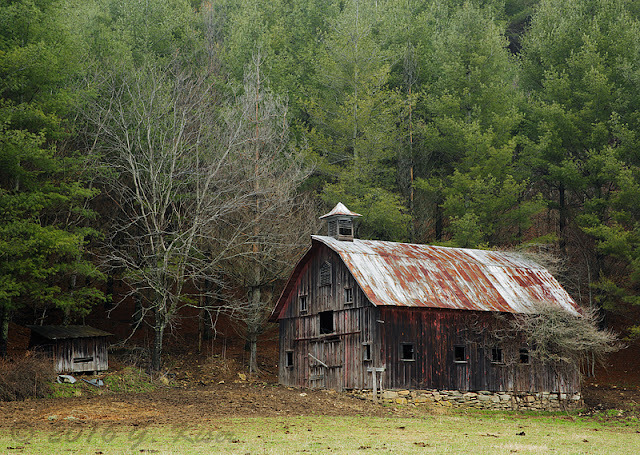 While all of this was going on, I got an email for a print request from my favorite barn shot in Jefferson, Rust and Splinters. OK, this was starting to get real. I was actually having to juggle orders in my head. I had one about to be delivered, one being ordered, and several others being spoken for. It was a stress I was happy for, but again, it was rather scary. Well, I had kind of floated around with my photography at the beginning of the year with no intention of making it a serious venture. There were a series of mundane trips through the year, and then, the computer crashed. Once I got things up and running once again, I found new inspiration in my craft. I have not seen the saddle of my bike in months now, and I have been fully involved with my photography. Not only am I out trying new things with old locations, I am learning all that I can about the art of photography, along with post production. There are still things that I have no interest in doing in Photoshop because it damages the integrity of the image, but I'm really liking the photo specific nature of Lightroom, and the opportunities that it is opening up for me. In each of the images here, I have stretched what I thought I was capable of as a photographer. The techniques I have used here have focused on exposure latitude, and really trying to pull the details that were captured by the camera. I'm by no means fully proficient, but I have to say that the work that I am producing here in the closing months of 2016 is by far the best that I've done since starting back in 2005. I have much to learn still, but I'm breaking out of my restrictive molds which have kept me prisoner for so long. In many ways, I have Toni to thank for much of my success this year. Whether it is her voice telling me to photograph a certain tree, or her constant support of my long days along the Blue Ridge Parkway, she is always behind me. I am very fortunate to have her by my side, and am very fortunate that she has an artist's eye as well. I love you, my Photo Wench!